A grand mountain vista is always more impressive when it includes an expansive cloudscape below. If the cloud appears as a sea of white, like this one spotted by Anke Putz (Member 43,181) from the Black Forest region of southwest Germany, it is known as Stratus after the Latin for ‘spread out’, or ‘flattened’. Hills and mountains rise like islands and coastlines from the gentle undulations of this calm atmospheric ocean. This marine resemblance is more than superficial. Teased by the wind, the stable layer of Stratus cloud can behave very like a body of water. Marking the boundary of colder air below and warmer air above, the cloud sinks to equilibrium in valleys like water in a sea basin. Waves roll across the surface of the cloud like slow-motion versions of their ocean cousins and lap up against the craggy shores of the mountain slopes. In the case of clouds, the wave movements tend to be a little more complex because they usually roll over air that is itself flowing as wind. For this reason, waves travelling over a cloud like Stratus are more akin to those on a flowing river or some swift ocean current. When you view them in time-lapse the movements are just as mesmerising, if not more so, than those at the seashore. The Unseen Sea, a classic video by master time-lapse photographer Simon Christen, shows waves rolling across Stratus clouds in the bay area of San Francisco, US. 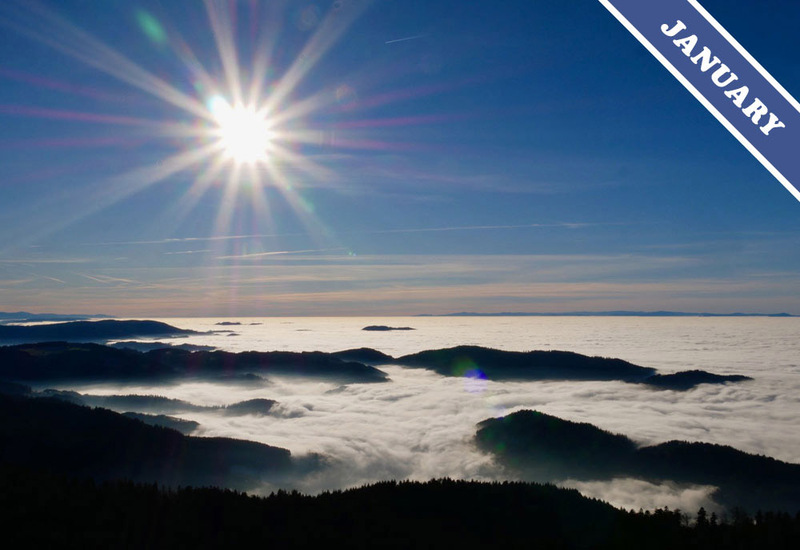 Stratus cloud spotted by Anke Putz (Member 43,181) from the Black Forest of southwest Germany overlooking the Rhine valley, with the Vosges mountains of eastern France in the far distance. Quotation is the poem ‘By that Long Scan of Waves’ (1885) by Walt Whitman.